This entry was posted on Thursday, January 20th, 2011 at 8:01 pm and is filed under Book/Film News, Grauman's Chinese. You can follow any responses to this entry through the RSS 2.0 feed. You can skip to the end and leave a response. Pinging is currently not allowed. Was there anyone around the construction site other than the man who “Took them home” that thought it was odd these priceless Hollywood artifacts should be taken up like “junk concrete slabs” and discarded? I think there is something really wrong with this event! 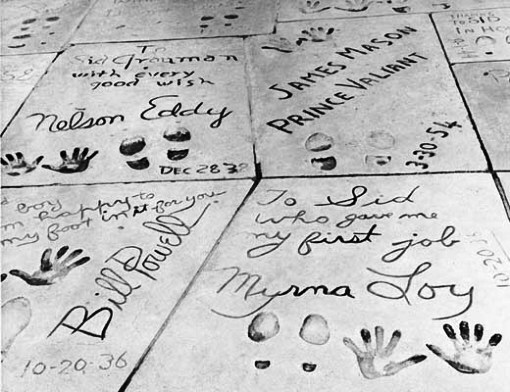 Why would anyone think the footprints and signed names of three of the biggest all time Movie Stars are not wanted as they are from another “Era”? If I had the honor of owning such a Great Place like Grauman’s, I would protect these ” Treasures” with my life!!!! I would fight any construction that would in any way alter or destroy these “Gem”. And to think that no one cared enough to know they were missing. Allan, thank you for posting this, I hope this will open the eyes of many who do not take History seriously. We need to preserve our past, so the future can see what we had done. I hope that these precious slabs can return to Grauman’s, and once again be admired by all. M father is the one who owens the lost footprints… he didnt just decide to take them. as a child i watched him try to preserve hollywoods natural wonder. i grew up at the el capitan and rocket hollywood candy store accross the street. my father restored that theatre!! he is in love with old hollywood. ive heard him on the phone trying to return the footprint to grauman’s and for them to say no one has ever contacted them befor makes me sad. Perhaps this is just a unique situation and it can be easily resolved. Since all parties desire to return the slabs, what else is needed? Does the theatre not want them? I apologize, I missed part of the above article. If the theatre does not want them, I would be happy to buy one, at a reasonable price. Leave a note here so I can reach you for a list of names of those available. Hello Larry Nelson … There are always many sides to one story 🙂 Do you have an email So I can send you more information?